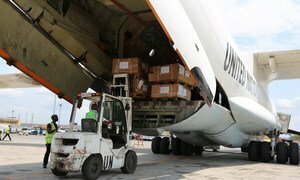 Election materiel being loaded in Kinshasa, Democratic Republic of the Congo (DRC), onto an aircraft of MONUSCO to be routed to Lubumbashi. Expressing concern over the political situation in the Democratic Republic of the Congo as well as in light of the upcoming elections the United Nations Security Council has called on all stakeholders to ensure that the polls are conducted in a free, fair, credible, inclusive and transparent environment. In a Statement read out in a formal meeting by the President of the Council, the 15-member body “called on the authorities to respect human rights and fundamental freedoms, especially the right of peaceful assembly, and to exercise maximum restraint in their response to protests. The Council further underlined the need for the Government and its national partners to accelerate preparations for the elections without further delays, including by expediting the update of the voter registry. It further noted it remains concerned over the risk for destabilization of DRC and the region as a whole, as illustrated by the violence of 19-20 September 2016, in the absence of a swift and consensual resolution to the current political crisis, and called on the Government to hold accountable those responsible for the killings as well as all violations and abuses of human rights. Also, the Council expressed deep concerns over humanitarian situation and persisting violence in eastern DRC, in particular, North Kivu province, and called on the Government to “end the threat” posed by the Allied Democratic Forces (ADF), the Democratic Forces for the Liberation of Rwanda (FDLR) and all other armed groups operating in the central African country. It is estimated that nearly 840,000 people have been displaced in North Kivu and more than 700 civilians have been killed since October 2014. Further in the Statement, the Council also welcomed regional initiatives to promote peace, stability and democracy in the DRC as well as the reform of the governing mechanisms of the Peace, Security and Cooperation (PSC) Framework for the DRC and the region. Also at today’s Council meeting, Special Representative of the Secretary-General Maman Sambo Sidikou and the head of the UN mission in the country (MONUSCO) informed the members of the Council that the mission continued its engagement with the Government, political parties and civil society and that it has updated its contingencies and adjusting deployment to mitigate politically driven violence and to protect civilians, to the extent possible, within its available resources and in its areas of deployment. However, Mr. Sidikou, added “these efforts may not be fully sufficient to mitigate or respond adequately to any major outbreak of politically-related violence,” and underlined that it was political will of the main political actors that would determine how the existing tensions will be managed, and whether or not these degenerate into violence. He also expressed caution at the deteriorating economic situation and its adverse impact on the stability of the country. “Socio-economic factors constitute an important potential trigger for violence in this period,” he said.